You can find this screen in the Main module via Info > Active Users. If it shows only your user/computername, it looks good and you can perform the backup. If there are more than 1 user, please ask your colleagues to close Eventure during the backup and the update. Depending on the number and the size of the existing conferences, this may take several minutes to about an hour. When the backup is ready, the message below will appear. Tip: Write down the locations of the Eventure folders before you close Eventure. You'll need them at Step 4. Close Eventure before running and installing the files. While Eventure is open, not all the files can be updated and the update will likely fail. After you have received the files (in .ZIP format), unpack the ZIP file in your downloads folder. The .ZIP file "Standaard Membership DB Overwrite" is only needed when you have the Membership module. Extract each .ZIP file in his own folder. Copy the files from the BENODIGDE_FILES_DLLS to the Application/EVENT folder. Overwrite the existing files. Copy the files from the Standaard DB Overwrite to the Data/EVWDATA folder. Overwrite the existing files. 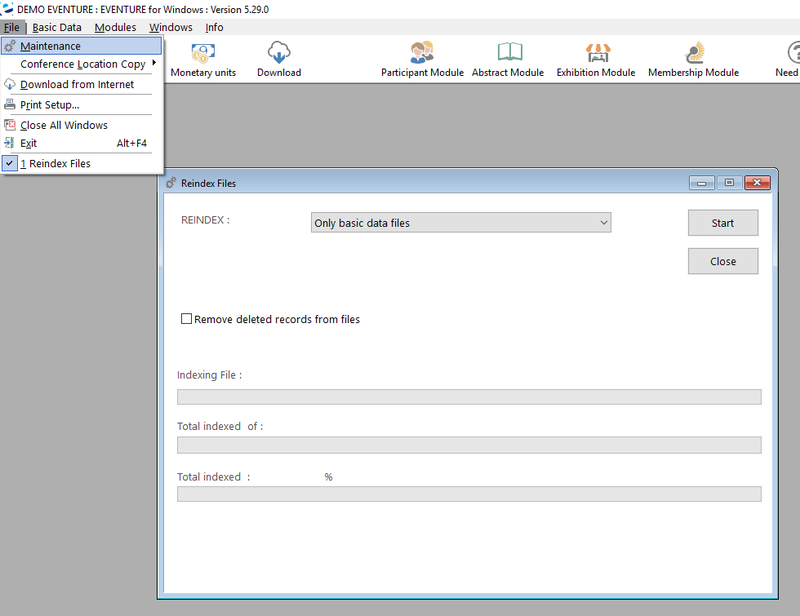 Copy the files from the Standaard Files Overwrite to the Data/EVWDATA folder. Overwrite the existing files. Only if you have the Membership module copy the files from the Standaard Membership DB Overwrite to the Membership/EVWMEMBER folder. Overwrite the existing files. The last step of the update can be done from the Main module of Eventure. Start Eventure from your desktop or run the EVFORWIN.exe file in the Application folder. Find the Maintenance menu via Main module > File > Maintenance. In the dropdown menu, first choose 'Only basic data files' and click start. The reindex is done when the Total indexed bar is 100% (or more...) and the start button is available again. Then, choose 'All files including basic data files' and click start. Eventure will now reindex all the databases of the conferences, this can take some time. This was the last step of the update, the users can now start working in Eventure again.